Ifemelu heads for America, leaving her family and boyfriend, Obinze, in military-ruled Nigeria. Finding a job proves to be more difficult than she thought. Despite her academic and blogging success, she is forced to deal with what it means to be black in America. Unfortunately Obinze could not follow her to America post-9/11 so he begins an undocumented life in London. They lose touch while starting individual lives but the love is still there. The New York Times listed Americanah as one of the Top Ten Books of 2013. 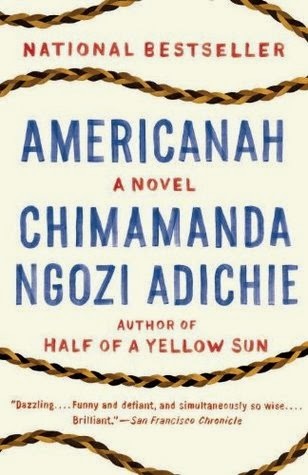 Chicago Tribune and Seattle Times rated Americanah as a Best Book. Entertainment Weekly chose Americanah as a Top Fiction Book. Goodreads picked Americanah as Best of the Year. My cousin and a few bookhearts recommended I read this book. Alas, I got a chance to read what all the hype is about. I am usually skeptical of books that get a lot of high praise. I expect it to be darn near perfect and am sometimes left disappointed. Well Americanah deserved every single award win and recommendation. I am so looking forward to it becoming a movie starring Lupita Nyong'o and David Oyelowo. I only have a couple gripes which prevented me from rating it a solid five hearts. Ifemelu was not likable. At all. I tried to be on her side but she came across so jaded. I wonder if it was the author's intent to make her main character this opinionated and harsh. Some of her views are totally misconstrued (American childhoods, tipping and medication especially). More than a few of her actions got a side-eye. I turned my brow up at a couple of Ifemelu's blog posts on Raceteenth or Curious Observations by a Non-American Black on the Subject of Blackness in America. I just did not like her. My second gripe is the book's length. It didn't have to be almost 600 pages long. The same story could still be told in less than 400 pages. Minor story lines were too descriptive while other themes (like depression and suicide) could have been expanded. I am an avid reader with too many books, not enough time to spend reading pointless pages. Other than that, I really enjoyed the story of love, race, culture and identity. The characters were well-developed, realistic and unforgettable. Americanah was an eye-opening novel for me because it gave a glimpse of how non-Americans may view Americans. I appreciate how Chimamanda wrote about race differences in a fiction format. Chimamanda is a Nigerian-American author. This gave her credibility in my eyes when reading the comparisons between America and Nigeria. I may not have liked the main character but Chimamanda did an excellent job of writing her third novel. She is also the author of Purple Hibiscus and Half of a Yellow Sun. Watch the video below of the author discussing love, race and hair—a few of the central themes in Americanah. Then share your thoughts if you've already read this novel. If you haven't yet read it, be sure to.